University President Morton Schapiro discusses the status of the “We Will” campaign at his annual address on the state of the University. Schapiro and two other administrators answered staff and audience questions at the Thursday morning event. 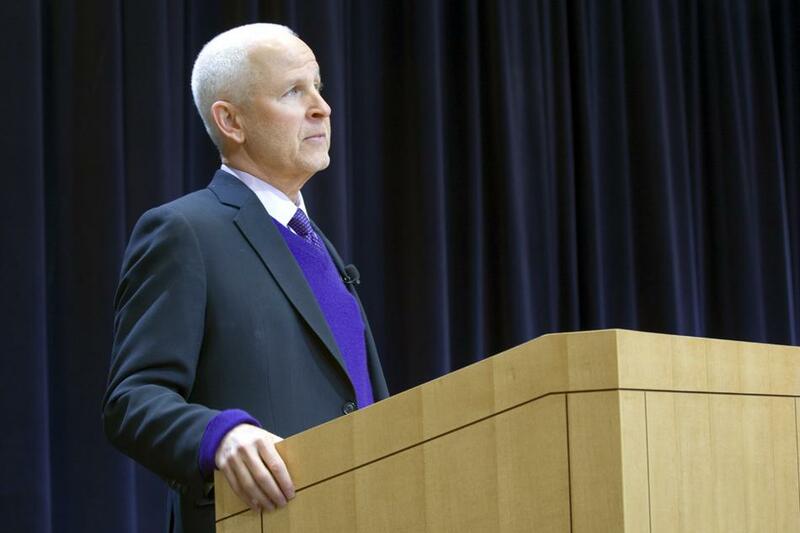 University President Morton Schapiro highlighted the University’s efforts in fundraising and inclusion at his yearly address Thursday morning. Schapiro was joined by executive vice president Nim Chinniah and Provost Daniel Linzer at “Conversations with President Schapiro,” which began with brief remarks from Schapiro, followed by a moderated panel and audience questions. Schapiro highlighted the success of the “We Will” campaign, the University’s $3.75 billion dollar fundraising push announced in March 2014, which he said is going better than expected after large gifts such as the more than $100 million donation in January from billionaire investor Warren Buffett’s sister Roberta Buffett Elliott. NU intends to use part of the money raised in the campaign to expand its faculty and add more endowed chairs, Schapiro said, though the size of the student body will not change. Linzer spoke about the search for a vice president for diversity and inclusion, which he said is still in the early stage of identifying potential candidates. Many have expressed interest in the position, which Linzer credited to NU being “well-known around the country for its efforts” on diversity and inclusion. He said the position will focus on two main areas: Everyday programming around diversity and inclusion and navigating crises related to such issues. “This person has to be resilient and able to navigate at the front lines with people who are upset at that moment,” Linzer said. All three administrators spoke positively about NU’s recent efforts in diversity and inclusion, but tempered stories of recent successes with cautions about current and future challenges. During a Q&A after the event Alecia Wartowski, director of programs at the Women’s Center, asked the panelists about plans to address campus climate to make it more inclusive, saying she has heard from faculty and students that navigating the university while grappling with issues of identity is “very difficult.” She said she mostly agreed with the administrators’ assessment. The panel included discussion about global initiatives, which Schapiro identified as an “important part” of the University’s strategic plan. Chinniah echoed the importance of a global focus. “We cannot be a great research university of the future without a global footprint, and we have an incredible set of assets at Northwestern,” he said. Although the NU Staff Advisory Council and the Office of the President have collaborated on an annual state of the University address since before Schapiro’s arrival, this was the first year the talk was in a panel format. In past years, Schapiro spoke alone, then answered audience questions. Rhea Banks, vice chair of the council, told The Daily the council decided to make it a panel this year to give the audience “a different view.” In previous years’ talks, Schapiro would invite other administrators in the audience to join the discussion, but this year they had a more structured role in the event, she said.